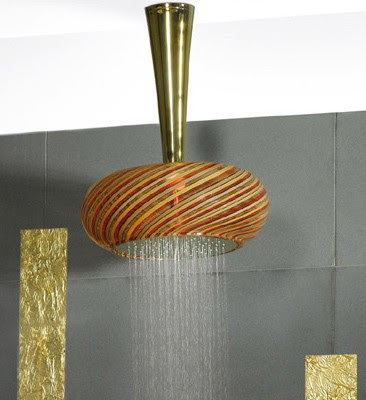 I don't know about this Soffi Gold Fever Murano Glass waterfall faucet from Bongio. I can't decide if it reminds me more of an upside down retro table lamp or alibaba's turban. I am certain that if it were in our shower someone would hit with a shampoo bottle on day one and it would be raining Murano sprinkles and I don't think we'd be singing this song. I love me some Annie! The Murano: although I too would fear the broken glass, it does have an excellent Genie-bottle mushroom vibe. A touch of the psychedelic, yes. Groovy!